Teotihuacan is known as the "City of the Gods"
The largest particle detector in Mexico is being built inside a pyramid in the ancient settlement of Teotihuacan. The equipment will detect muons, tiny particles that are created when cosmic rays bombard the Earth's atmosphere. Dr Arturo Menchaca and colleagues from Mexico's National Autonomous University hope that by tracking the muons through the pyramid, they can find cavities. This could indicate whether the kings of the ancient people who built the site are also entombed within it. 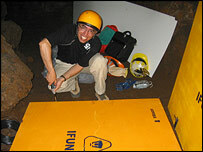 "Down we go - and mind your head," Dr Menchaca says, as he adjusts his yellow hard-hat, and lowers himself down the rusting iron steps in to a dark 2,000-year-old tunnel running beneath the Pyramid of the Sun. It is a 100m walk along the cramped tunnel to the team's new laboratory, a plastic shed set up in a cavern in the bowels of the structure. Above, many thousands of tonnes of rock and earth silently press down. The experiment is costing half a million dollars. At the moment, it resembles a large, flat metal plate, connected to a box of wires with a monitor displaying a flickering yellow line. This is the machine that tracks the muons, sub-atomic debris left over when cosmic rays smash into molecules in the Earth's atmosphere. They travel at near the speed of light and pass through solid objects, leaving tiny traces. When a muon hits the receptor, the yellow line leaps up and down in spikes. "The idea is to try to discover density variations in the pyramid," Dr Menchaca told BBC News Online. "In order to do that you either need to drill holes, or find something that goes across your volume. "These cosmic rays are very penetrating radiation. Some of them go through this pyramid, and some of them are absorbed. "The amount which is absorbed depends on the material which it finds. If we find more muons than we expect, then there is less matter in that part of the pyramid". Less matter could indicate the cavity of a burial chamber. This experiment taking place beneath the Pyramid of the Sun is already attracting the attention of the nation. Leading daily newspaper El Universal's cultural editor, Maria Elena Matadama, believes that it will take our understanding beyond the realms of Indiana-Jones-type speculation. "It's very important because Mexicans today see these old sites as dead cities - just as mountains of stone," she said. "Everyone climbs up and down the pyramids without understanding what happened there. We must understand that they were cities - like the city of Mexico." In the humid cavern, all around are traces of this early civilisation, known locally as the Teotihuacans. Not much is known about them apart from that they inhabited this site around 700 years before the Aztecs. The city they built here was once the largest metropolis in the Americas. It rose and fell around the same time as ancient Rome. Dr Arnulfo Martinez is thrilled to be involved in an experiment which is crossing the boundaries between physics and archaeology. He points at one rocky wall. "You see this? This is original plaster - you can see the fingerprints of the people who layered it there. 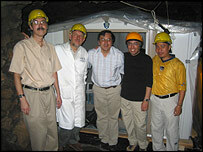 "What's exciting is that we are using cosmic debris to uncover an ancient Mexican mystery. "The building of this place is very linked to who we are. What's important is that people get excited about science because of these kinds of projects." It will take more than a year before any tangible results are obtained. 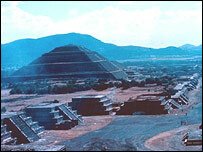 But then Teotihuacan, the "City of the Gods", has kept its secrets for more than two millennia. The world will have to wait just a little bit longer.